Mountain River Cabins has your dream North Georgia cabin waiting for an unforgettable vacation in the beautiful mountains near the charming town of Blue Ridge. Our four upscale cabins each have fantastic water and mountain views, and two have frontage on the water. All have outdoor hot tubs and game rooms with pool tables. Find out for yourself what our many loyal repeat guests have discovered about our North Georgia cabin rentals--first-class lodge style cabins, maintained with loving care, that provide the ultimate relaxing environment for escaping the hustle and bustle of city life. 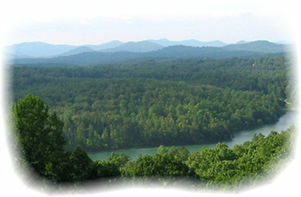 Lakeview Lodge overlooks Lake Blue Ridge and has a three-state view of the surrounding Blue Ridge Mountains. National Geographic has filmed the view from the cabin for a TV special. 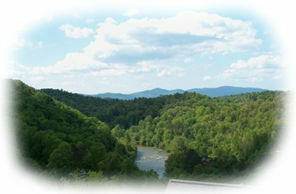 River Ridge overlooks the whitewater Toccoa River with a three-state view of distant mountains as a backdrop. You can hear the sound of the rushing water echoing up from the river. Whitewater Overlook is perched above Fightingtown Creek, a premier trout stream, and has a year-round mountain view. Lake Escape is a large, lakefront cabin with a wall of windows facing Lake Nottely, a huge mountain lake with over 106 miles of shoreline. Blue Ridge, Ga. is an easy, scenic 90-minute drive north of Atlanta by freeway and four-lane parkway. Our Georgia cabins are available for rental year-round. Each season has its own unique beauty: dogwoods, mountain laurel, and rhododendron in the spring; the deep blues of the lake, river, or creek and dark greens of the trees in the summer; a vast sea of hardwoods that are on fire with color in the fall; and, if you're lucky, a white blanket of snow in the winter. Click on the Availability Calendars symbol on the left side of any page on this site to see which dates are open at each cabin. Click on the Reservations button to book a cabin or to get more information. down the river (River Ridge) from any room in the cabin. Follow a Great Blue Heron as it skims along the creek (Whitewater Overlook) or take a summer swim in the lake just down the path (Lake Escape). At night, pop in a DVD or videotape and enjoy a movie in front of the fire. If you can tear yourself away from all that relaxing, there are plenty of things to do in the area, including all kinds of lake and river water sports, hiking, mountain biking, antique and crafts shopping, railway excursions, scenic drives, and golf. The National Forest Recreation Area at Morganton Point is less than ten minutes from Lakeview Lodge and offers swimming, a white sand beach, picnic areas, a bath house, and a boat ramp. Hike around Lake Blue Ridge through the Chattahoochee National Forest, which borders only steps from the cabin. River Ridge and Whitewater Overlook are only 15-20 minutes from several Ocoee River outfitters, where you can book an adrenaline-pumping whitewater rafting adventure on the same course used for the 1996 Olympic whitewater competition. Lake Escape has a beautiful 4180-acre mountain lake at its doorstep. There is abundant wildlife in the Blue Ridge area, including black bear, whitetail deer, and wild turkey. Our cabins offer peace and quiet and cool mountain breezes, but are only 10-20 minutes from the shops and restaurants in Blue Ridge. We hope you will make one of our North Georgia cabins your second home in the mountains and will return again and again. Please bookmark our site and come back often. Be sure to check out the Mountain River Cabins Facebook Page, post your comments there, and become a fan by clicking Like on our Page. Also, follow us on Twitter for the latest special discounts and other valuable information. Thank you for considering North Georgia cabin rentals from Mountain River Cabins. Thanks for considering our North Georgia cabin rentals.